The central scenarios of Victory Games Aegean Strike are hypothetical World War III contests, pitting the mid-1980s U.S. military against the powerful conventional forces of the Soviet Union, specifically covering the eastern Mediterranean theater of operations. The second tier combatants in this game are Greece, Turkey and Bulgaria. There are scenarios that cover other potential situations in the region, such as a war between Greece and Turkey, a Soviet attempt to remove NATO Pershing Two missiles from Turkish soil by force, and a scenario that links up with Gulf Strike. The situations described in the scenarios are interesting enough to attract gamer attention. Victory Games Gulf Strike is such a favorite of mine that I had a positive bias before even opening the Aegean Strike box, making the writing of an objective review difficult. But, not so fast… even though both games share a common rule set, Aegean Strike is a very different game with a very different feel and tempo. Airbases, and associated Air Defense units, are printed directly on the map – In Gulf Strike, airbases were distinct counters. Each airbase counter had a corresponding box on the Airbase Display. It was a bit difficult to keep track of where all your air units were based, but not excessively so. Aegean Strike has the airbases printed directly on the map. The Airbase Display has a box for each Airbase on the map. The first problem is that the Airbase display, in most cases, doesn’t even show the name of the city; it only shows a hex number. It would be so much easier to see “Larisa” on the Airbase Display, rather than just seeing “1615” and having to look on the map to find out that the city of “Larisa” in Greece is located in hex 1615. Marker shortages – The number of informational markers included in the game is inadequate. Many of the scenarios list units that start the game with hits already accrued (i.e. units that are not fully “mobilized”). Division sized units will have 6 hits accrued, but there are insufficient “6” hit markers to cover all the divisions that require them. Because a “7 turn” (or “20 turn”) game means 7 turns (or 20 turns) after hostilities actually commence, the game could use a marker to indicate this turn of commencement. “Undetected” markers commonly run out early in the game (before the Soviet navy is decimated). Also, it would be helpful to have markers to indicate successful Close Air Support missions, Declared Combat situations, and Interdiction markers, rather than having to use markers from another game. No markers are provided to identify Turkish Strait hexes that have had their Bombardment Rating permanently eliminated. There are other examples of markers that I had to devise on my own, but I don’t want to beat the subject to death. Suffice it to say that a business decision was likely made to save costs by reducing the number of counters. Fair enough. Like Gulf Strike, the rules are excellent. There are remarkably few omissions and ambiguities considering the complexity of the game. The “Charts, Tables and Examples Insert” provides a good range of examples for some of the trickier concepts and the charts are mostly understandable. One notable exception is the “Troop Quality Effects Matrix” which probably doesn’t really need to exist. The matrix attempts to cover all possible combinations of troop quality (Elite, Line, Militia) for the attacker and cross-references that with all possible combinations of troop quality for the defender. The cross-reference then shows the final column shifts (+ or -) to be applied to the combat. A quick analysis of the matrix shows that it can be simplified to a comparison of the “worst” troop quality present among the attackers and the “worst” troop quality present in the defending stack. In other words, if the attacking stack contains both Elite and Line quality troops, the resulting column shifts will be the same, for each defender troop quality combination, as if the attacker only had Line quality troops. Spend a minute looking at it, and you’ll see what I mean. A good case can be made that many of the Optional Rules listed should have been incorporated into the main rules set as they are always used in actual play. In particular, the “Variable Aircraft Speed” optional rule that debuted with Aegean Strike should be part of the core rules set for Aegean Strike and Gulf Strike, since it adds such value to the simulation. This new optional rule takes into account the differing speeds of the aircraft represented in the game. The idea that a Mig-29 just couldn’t seem to be able to catch up to a C-130 that had a 3-hex (i.e. 84 kilometer) head start always seemed kind of odd, so the new rule was well received and widely implemented. Turkish Order of Battle (All Scenarios) – Several references to “within X contiguous land hexes of Istanbul” really shouldn’t include the Turkish mainland, because you would have to cross the Bosphorus Straits to get to the mainland. I guess the bridge might make it contiguous for ground unit movement purposes, but it would have been nice to have some clarity (i.e. “within X contiguous land hexes of Istanbul, considering the two hexes on opposite sides of the Bosphorus Straits to be contiguous”). Soviet Order of Battle (All scenarios) – Several references to “any Soviet hex”. It’s not clear if that includes Soviet satellite hexes, such as Libya and Syria. The legend on the Strategic Map identifies red hexes as “USSR/Allied use”, but is that the same as a “Soviet” hex? 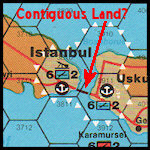 The large Soviet ground reinforcement contingents that begin appearing on turn M+5 are directed to appear in “any Soviet Strategic Hex”, which leads me to believe that “Soviet” hex in this context means hex in the Soviet Union proper because I find it hard to believe that the Soviet 19th Army would be allowed to mysteriously originate in Syria. But, if “Soviet” does mean USSR proper, then would this apply also to Soviet naval units? If so, then it would make the Libyan and Syrian ports available only to Soviet naval units that can get through the Turkish Straits before the war breaks out. As a final word on this subject, Soviet Air Units are directed to appear on “any airbases on the Soviet Air Display”, which would clearly include Syria and Libya. Can you blame me for being a bit confused? I know these are not really big deals, but I just despise even the slightest ambiguity in game Setup instructions. There are many good examples in the rules book itself and the “Charts, Tables and Examples” insert (a 16-page insert that contains about 16 illustrated examples of the main game concepts); movement, detection, combat (air, naval and ground), supply, and amphibious operations. The charts provide quick reference for most of the frequently used information and the combat table is easily comprehended. Here’s that bias creeping in again, but it has to be noted that Gulf Strike is, in general, a better game. For several reasons which I’ll enumerate when it makes sense to do so (don’t want this to become an article about Gulf Strike!) but I suppose the main reason is that it lacks the sweeping grandeur of Gulf Strike (that’s right… I used “sweeping grandeur” in a sentence), where Soviet Armies maneuver over vast open areas of varying terrain, lay siege to major cities, and direct massive air armadas at enemy armies and navies. Aegean Strike, by contrast, can be described as “Gulf Strike in a phone booth”. It’s a much more congested space, and the map becomes very crowded very quickly. Not that there isn’t any room at all to maneuver, but the victory conditions in the major scenarios channel all the combatants towards Istanbul; the center of the phone booth. In short order, Soviet and Bulgarian Divisions (and there’s a ton of them) find themselves tripping over each other to get near Istanbul. However, Aegean Strike adds some elements that are not found in Gulf Strike, such as the uncertainty of knowing when the war will actually break out. This uncertainty factor should be given credit for adding a lot of replay value to the game. You’ll never know how many reinforcements will get in theater before hostilities commence and what shape your mobilization units will be in either. It’s actually one of my favorite aspects of the game. Some of my gaming colleagues see this differently. They say that if the war breaks out very early it favors the U.S. player because there will be more time for them to establish positions before the Soviet armies even arrive as reinforcements, and vice-versa if war breaks out late. Their complaint is that the winner is really decided by this luck element. I guess you’d have to play quite a few games in order to prove or disprove this theory. The unusual terrain feature provided by the Turkish Straits also adds an interesting operational consideration to the game. How much of the Soviet Navy can get through the Straits and into the Aegean and/or Mediterranean before war breaks out and the Straits are closed? There isn’t a whole lot of cat-and-mouse action in naval operations in Aegean Strike. The Soviet subs try to position themselves to inflict maximum damage when war breaks out. The Soviet surface fleet makes a run for the Turkish Straits and hopes to not be trapped there or in the Black Sea when the music stops. But, in most cases, the U.S. Navy makes short work of the Soviet fleet. It’s just a matter of how much pain they inflict on the U.S. fleet before they go down. But it’s fast, furious naval combat. You have to like that. The air war is also quite intense in this game. In Gulf Strike, actual air-to-air combat happens a lot less frequently than you might think. There’s a huge amount of air space to maneuver in. Since ground combat actions occur on several widely separated fronts, even most close air support missions tend to go un-intercepted. 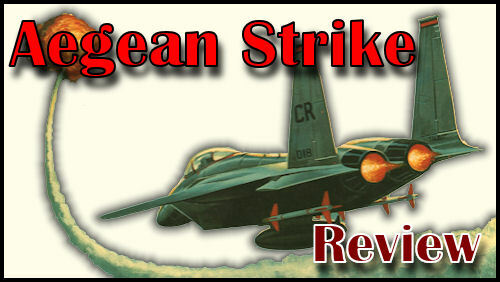 Aegean Strike is a totally different kettle of fish. It’s air combat in a phone booth as well. No sooner does an air unit go “wheels up” than it is immediately detected and fighting for its life. Again, the action is intense. The ground war is where the game bogs down. You literally end up with Russians and Bulgarians tripping over each other to get at the Turks and Greeks. 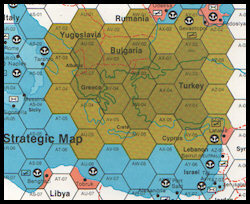 In both Scenarios 2 and 3, the larger scenarios, control of all the Turkish Strait hexes is a prerequisite for victory. Which leads to… you guessed it… ground combat in a phone booth. Scenario 2 has a “Short Game” (7 war game turns) and a “Long Game” (20 war game turns). In the long game, control of either Ankara or Athens is a second prerequisite for Soviet victory which widens the game out a bit as the NATO player cannot be sure towards which direction the Soviets will make their major push. But there will also be lots of crowded, intense ground combat in and around the Turkish Straits. Get your game tweezers out, unless you’ve got tiny fingers because there’s not going to be a lot of daylight between those units. All of this phone booth combat makes for a slow playing game (relative to Gulf Strike). I don’t mean that as a negative at all. It’s just a fact. If you prefer a faster moving game, then Aegean Strike may not be for you. You’ll spend a lot of time looking up detection ranges for various aircraft and naval units, and varying standoff attack ranges as well. It’s too much to remember off the top of your head, but some are worth remembering. For example, U.S. strike aircraft using their ASM rating can fire at Soviet surface naval units from 4 operational hexes away; Soviet surface naval units can’t try to detect enemy air units until they’re within 3 operational hexes. Write that little tidbit down immediately before you forget it, U.S. player. Another key, but often overlooked, aspect of the game is Special Forces. The Soviets have an overwhelming advantage here (30 Spetsnaz detachments compared to only 9 U.S. Special Forces detachments). But it comes down to resource management again. Running Special Ops is like a full time job in Aegean Strike. You must stay focused on where your detachments have been assigned and to what task they’ve been assigned. Without going into a detailed explanation of how Special Forces work, let’s just assume you’ve got each of the 30 Spetsnaz (Soviet Special Ops) detachments assigned to Ambush missions. There are no game counters to represent these detachments, but there is a “Warsaw Pact Player Record” where you will write down the 30 hex numbers to which these detachments have been secretly assigned. Then you have to watch every movement of enemy units to see if they stumble into any of your Ambush hexes. It’s really quite a job to stay focused on this while simultaneously managing all the other aspects of the game. But Special Forces can make the difference between victory and defeat, so you must focus. On one of the gaming sites (maybe ConsimWorld? ), I saw a post by Mark Herman (the designer) where he said that he never gave a thought to play balance. He was just trying to create a great simulation. If that means one side or the other get stomped every time, then so be it. You’ll find, however, that the realism of the game system puts the burden of success squarely on the shoulders of the players. Just as in real life, it won’t matter how high tech U.S. weapons systems are, if you put a bungling U.S. commander in charge against a very competent Soviet commander. The Soviet commander would still wipe the floor with him. So it is in this game. If you can manage your resources better, and devise a better operational plan than your opponent, you’re going to win. The rules suggest reducing available supply points as a handicap when players of differing skill levels play, which should work well as it makes it tough for even a great manager to allocate resources. But, ultimately, the great planner/manager will end up with the win. Scenario 1: Battle for North Africa is definitely worth playing since it’s a bit more interesting than the average mini “learning” scenario, and it’s actually quite competitive. This is not a strategy article so I won’t go into detail, but the initial setup positions in this scenario are really critical, particularly for the U.S. player. It will also give new players a good feel for the Naval and Air movement and combat systems. Scenario 2: World War III, Southwestern Theater of Operations is the heart of the game. If the game could only have one scenario, this would be it. Much of this review is based on my play of this scenario. Scenario 3: Turkish Missile Crisis is much like Scenario 2 except that Greece is neutral, leaving the Turks to their fate against the Soviets. Probably a much more realistic scenario, but I have not actually played it. Scenario 4: The Greco-Turkish War is your “taken from real world headlines” scenario (much like Gulf Strike’s scenario portraying the Iran-Iraq War), where the Greeks and Turks slug it out with each other. The “Game Length” paragraph is comical: “The game continues until both sides agree to a draw or either player achieves his victory conditions.” I’ll leave it to you to figure out how the scenario ends 99.9% of the time. Without Superpower assistance, nobody’s winning this war. There’s a bit of uncertainty in that the breakout of hostilities is randomly decided, as is the setup order (i.e. who has the disadvantage of having to set their units up first). Play this scenario to gain insight into why these two nations (both NATO allies) have not fought a war even though there’s such animosity between them. The Soviet Union may be long gone, and the Cold War may be over, but Scenario 4 is just as topical in 2010 as it was in 1986. Scenario 5: World War III is a scenario that links Aegean Strike with Gulf Strike. I have not played this scenario, but I’ll bet it’s a monster. So, if you like monster games, Scenario 5 is for you, I’m sure. If anyone’s actually played this Scenario, we’d love to hear from you at The Boardgaming Life, to get your feedback, scenario notes, series replay… whatever, for posting on this site. Overall, Aegean Strike an interesting game to play, but I would stop short of calling it a “fun” game. Victory Games was just not able to re-capture the magic of Gulf Strike. It also ranks pretty high on the complexity scale so if that puts you off, then you should definitely look elsewhere. It demands attention to detail and lots of planning. You need to be a great manager, book keeper and general to play well. Again, if that’s not your cup of tea, then you won’t like Aegean Strike. For those who have played Gulf Strike and don’t mind this type of challenge, you shouldn’t feel that, since you already own and have played Gulf Strike, you don’t need to bother with Aegean Strike. As mentioned earlier the two are very different games and you’ll find that you need a completely different mind-set (and battle plan) to succeed in Aegean Strike. Just because I didn’t find this game as engaging as Gulf Strike doesn’t mean that you won’t. Just have your game tweezers ready. Posted in Aegean Strike and tagged Modern Combat Games, Victory Games, War Game, War Game Review. Bookmark the permalink. Istanbul is divided in one European part , and one Asian part so both of the hexes with an anchor symbol should be considered as Istanbul city hexes. So no problem placing units three hexes into Asia minor. Great stuff! I bought Aegean Strike because of your review and played through a bit of the second scenario. Intriguing game and – yes, very different feel from Gulf Strike. Thanks Brad. I enjoy your articles as well.